During our Simple Machines unit, our final unit was on Wheels and Axles. We got these great wheels that can be attached to any cardboard box. They’re really well built and easy for a small child to use. And any time you’re done with a box creation, you can take off the wheels and save them for the next time. 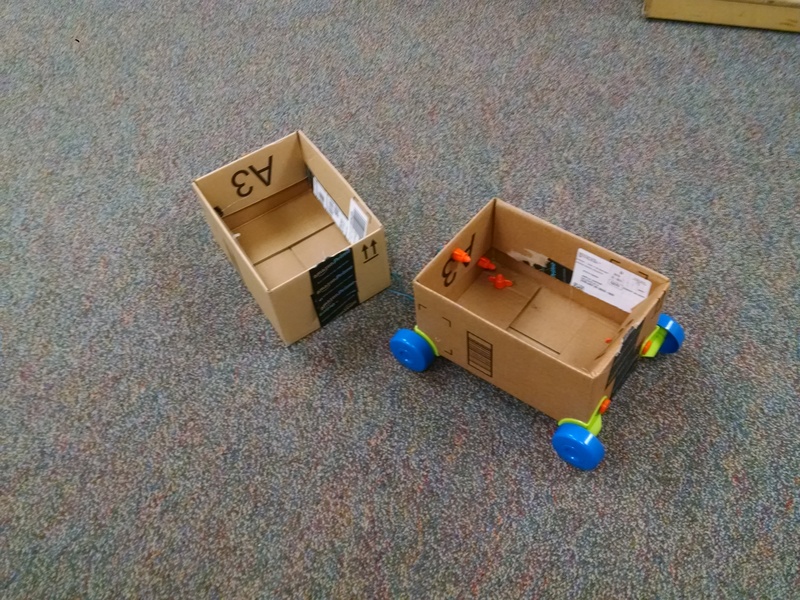 We had one box with wheels, and one box that was the same size without wheels. Kids could load them up and see which one was easier to move. We also had wooden dowels, and a basket – kids could load up the basket and roll it back and forth on the dowels. Building: LOTS of building toys include ways to make wheels and axles: Duplos/Legos, Tinkertoys, K’NEX, and so on. Put these out for free play. Observation: Encourage children to find all the wheels they can in and about the classroom (toy cars and trains, trikes, bikes, door knobs, and so on.) Encourage them to notice how the wheels work. One thing to notice is that with some things, the axle is fixed to the wheels and rotates with the wheels. But, in other cases, the axle is stationary and the wheels rotate around it (e.g. a skateboard). 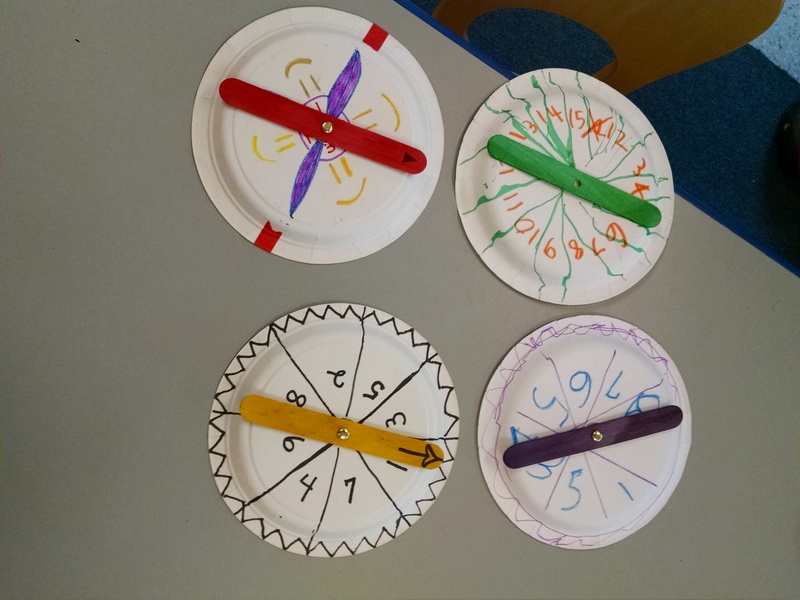 Craft – Pinwheels. 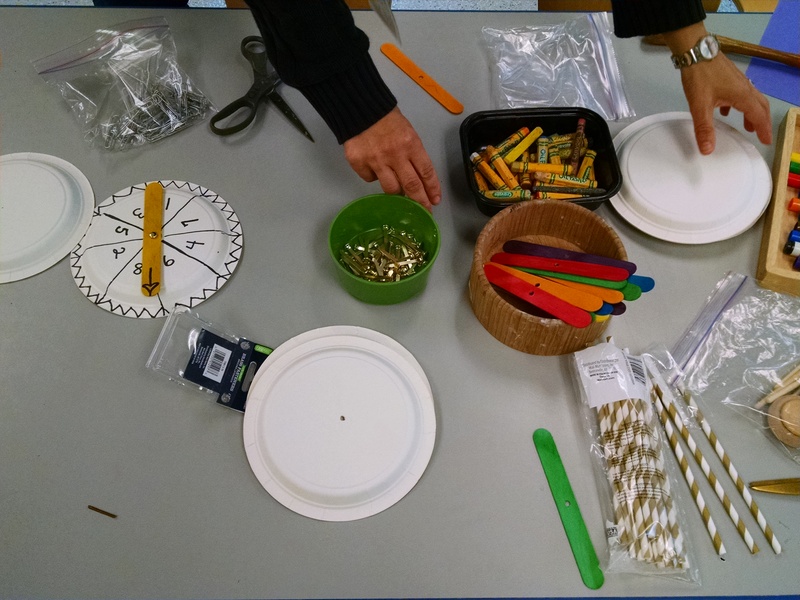 Last year, we made pinwheels – learn about them here. Art – Paint with wheels! You could use paint rollers, or a massage tool on wheels, or toy cars, or toy trains to paint with. Gears – this is also a great opportunity to bring in gears… We’ll use the ones from a Delta Science Modules kit we inherited. Building Sets: Some fun gear building sets include Gears! Gears! Gears!, Quercetti Kaleido Gears and Gearation Refrigerator Magnets . Skate Park: Fat Brain Toys sells this great Marbleocity “Skate Park.” This kit is definitely something that an adult needs to build (or a patient and cautious older kid.) But, once it’s built, it’s very cool for kids to play with – they turn the crank, which turns the gears, which launches the ball. If kids are careful, it’s fine. However, they NEED to be taught what to do if it jams. If a marble jams just a bit, they need to back it up (i.e. turn the crank a little the other way) to unjam it, then move it forward. If they try to force it forward, it WILL break the crank. As we learned at the beginning of our morning class, when one of our older and pretty careful kids was playing with this. I’ve repaired it now, and will use it next year as a demo where we can show kids how to handle jams carefully. The one thing I wish were different about this kit… it does not use standard size marbles, but instead uses specialized mini marbles. I’m hoping it’s possible to find replacement marbles somewhere if needed, but I haven’t found them yet. Toy: We also put out this cool Duplo top launcher, already assembled, plus dir ections on how to build it, so kids had the option of taking it apart and re-building it. (None took that option.) This is a REALLY cool toy. But, the motor skills required to launch a top were more than any of our 5 and under kids could really manage. Books: We had several books from series about Simple Machines. We read in circle Pete the Cat: The Wheels on the Bus by Dean and Going Places by Reynolds. Outdoor time: Bikes, Trikes, and Wagons, oh my! For a wheels theme, you could obviously do LOTS of activities related to cars. We did a whole week just focused on cars as a complex machine. You could use almost any of these car ideas in a session on wheels. When you try to push a load across the ground, there’s a lot of friction that makes it hard to move. The whole surface area of the load is on the ground. When you put the load on wheels, then there’s only friction on the very small part of the wheel that is touching the ground at any given time. Thus, it’s much easier to move a heavy load over a long distance. We loaded up a basket with bags of dried beans for weight. We had our 8 year old teaching assistant push it across the ground. Then we showed everyone the rough surface on the bottom of the basket. Then we showed them the smooth bottom of a cardboard box. We placed the basket in the box, and pushed it across the ground. Much easier! Then we talked about friction. After that, we laid out several short lengths of PVC pipe on the ground and put our box on top of them and showed how much easier it was to move the box back and forth. (Just roll a very short distance back and forth. We talked about the idea that ancient Egyptians may have used a similar method to move the large stone blocks used to construct the pyramids, and showed them a picture of this process. We then tried to move the box a long distance on the dowels. The kids discovered that as you do this, the load rolls off of the dowels, and you have to move that lost dowel back to the front of the row over and over. 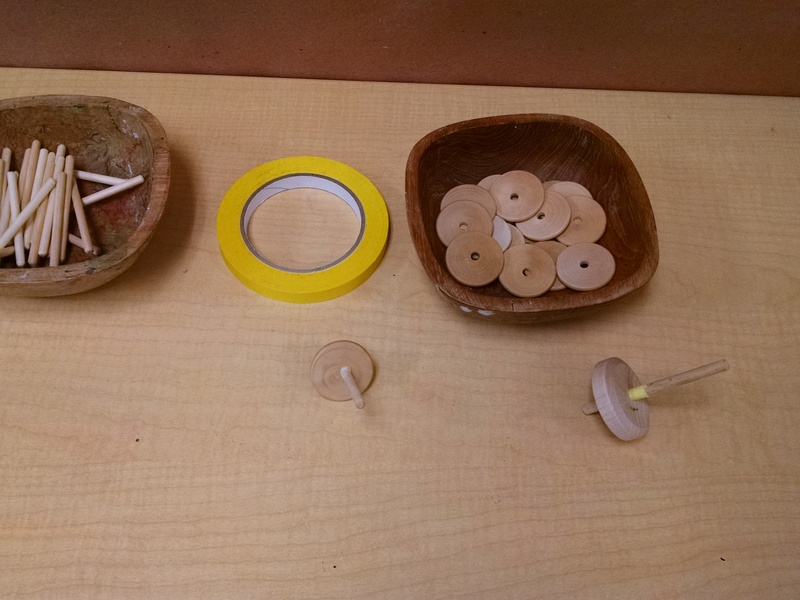 Then we taught the idea of wheels and axles, and mounting the load on a set of wheels and axles. There’s lots of ways you could do this… We used the wagon from our Simple Machines Set , but you could use any car or wagon to show what wheels and axles are. Then we placed our basket of beans in a box with wheels on it (see above) and had our assistant pull it all around the room to show how much easier that is to move.